Go on, step inside a Vantage and give that furniture a closer inspection. Even have a tug on those overhead locker carcases. Solid, aren’t they? And not a single screwhead (or cover) in sight. Those robust build values are just one aspect of how independent manufacturer Vantage likes to makes its high-top van conversions, selling direct to the public from its premises in Leeds. 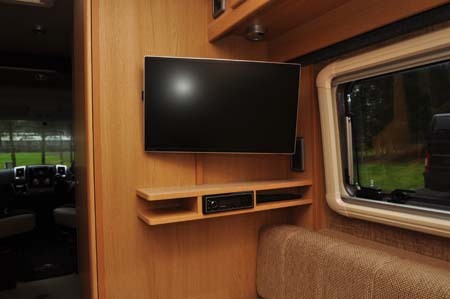 Its vehicles are the result of extensive motorhome touring by its owners, but that also explains plenty of thoughtful details. 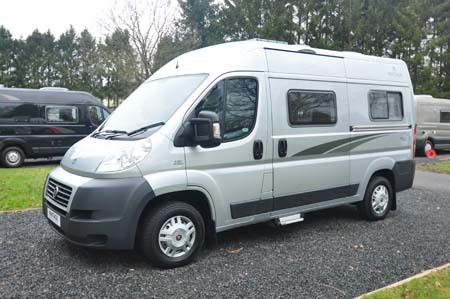 Med is the starter model – shorter and less expensive than its five sisters, all Fiat Ducato-based. It’s the only one that uses the medium-length van as its start point, too. 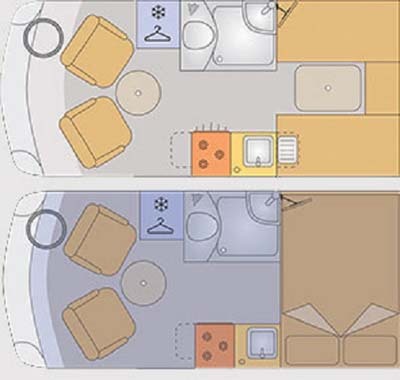 And here is very much a British floorplan that sees the lounge wrapped around the back, with a mid-‘van area divided between washroom (offside) and kitchen (nearside). 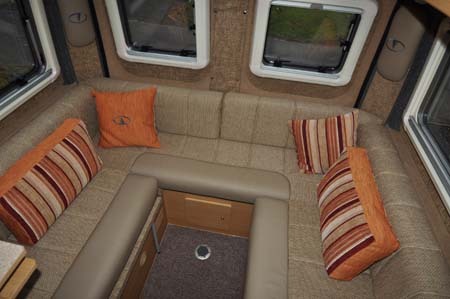 Here, too, there’s a separate lounge to be had by swivelling the front seats and adding a circular table between the two. That tabletop is set at exactly the right height so you can still open the fridge (a compressor model, with a larger than average 85-litre capacity) and wardrobe doors adjacent. Indeed, it’s also close enough to the kitchen to double up as an additional worktop area. Not that a kitchen like this needs much work workspace. There are already pop-up extensions (with easy-to-use brackets) at each end. In the middle there’s a Thetford Triplex cooker (three rings, combined oven and grill) alongside a sink large enough to accommodate a domestic-size washing-up bowl. Over this sits a loose drainer which comes with a stand-alone draining rack. Excellent storage in the base unit includes a set of drawers, plus there’s the Powerdock, a handy pull-up set of three mains sockets in the marble-effect worktop. It’s all in keeping with the superior qualities of this leisure vehicle. The washroom continues the sophistication. 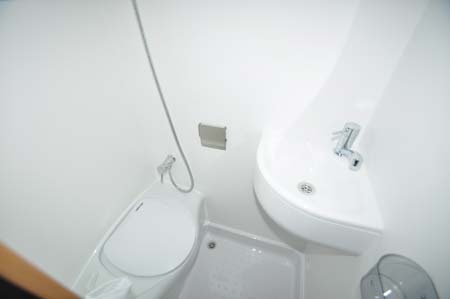 It’s all fully lined, the corner sink is to Vantage’s design, there’s a bench toilet and a shower with water-saving trigger operation. There’s just one sleeping arrangement in the Med, a 1.86m x 1.37m transverse double. Again, you won’t be surprised to hear it’s oh-so easy to make up, involving just one extending section that pulls out almost effortlessly. 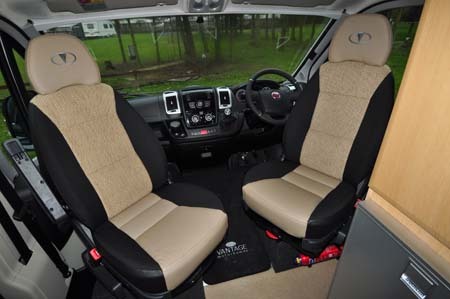 The storage arrangement under the seating means there’s plenty of space for your bedding to stow together, while the heating and hot water units are neatly housed on the offside, with dedicated storage above for anything you might like to keep a bit warm (Towels? Socks? Underwear?). Getting down to further details and it’s back to those lockers again. The hinges are top quality, ensuring the one-piece, foil-wrapped doors, when open, stay flush with the ceiling. Meanwhile, the runners for the drawers – indeed, the drawers themselves – are, again, just as reassuring. There’s more. The polycarbonate holders (one over the kitchen, several more in the washroom vanity unit). Aluminium table poles (plus tripod for if you want to set up outside). And there are things you won’t see. Like the excellent insulation. In case you’re worrying, there’s still plenty of payload here. Just as well, because there are some enticing options on offer. 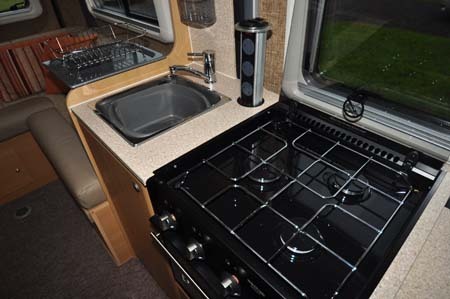 Indeed everything listed below is fitted to this demonstrator, on top of a generous starting specification that includes a solar panel and twin leisure batteries, plus a permanent gas tank. Vehicles as meticulously pieced together as this are never going to come cheap. But, it’s out in the field where they prove their true value. 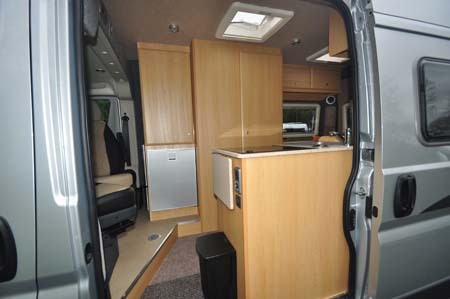 There’s more information on the Med on the Vantage website and to find out more about our low-cost premiums visit the motorhome insurance discounts page. Nice van, but do the bach doors open to take my small electric scooter? There is a picture on the Vantage website which shows bolts at the top of the rear doors that suggests they still open.